Your office is moving into the 21st century—you need a multifunction printing system that can do the same. The Muratec MFX-2355D from Pacific Office Automation can meet all of your company’s printing but can also provide you with a host of other functions that will improve your day-to-day processes. This machine boasts superior printing, scanning, copying, and faxing capabilities unrivaled by most multifunction printers on the market today. As a digital document management system, this printer allows you to distribute scanned items quickly using scan-to-email, scan-to-FTP sites, and scan-to-network folder operations. What better way to save time, money, and resources than to go paperless? Now memos, proposals, and reports can all reach their destinations without manual distribution. If you decide to go for hard copies, you can enjoy the easily-customizable settings on the MFX-2355D. Users can opt for criss-cross sorting, duplex printing, or a number of media types and sizes outside of typical printer paper. In fact, your office can customize many paper products as you use the 150-sheet multipurpose bypass tray to print on envelopes, labels, letterhead, transparencies, and more. If the standard 500-sheet paper cassette doesn’t deliver your desired capacity, you maximize your volume with a 2,500 large capacity cassette. With this addition, you can improve workflow as you move through processes and communications quickly and without pause. With countless means by which to improve your office connectivity, there is no reason to pass up this valuable investment. Contact Pacific Office Automation for more information on this and other efficient Muratec printing systems. -Interactive voice guidance system provides step-by-step instruction for paper jam removal, machine set-up, job execution and more. -Macro keys allow users to consolidate lengthy job commands, or group folder shortcuts together, into a single executable command. -Two 500-sheet cassettes come standard, each capaple of handling letter, legal or ledger size media. -Standard criss-cross sorting, which automatically rotates each set during a print/copy job, to create a distribution-ready output. 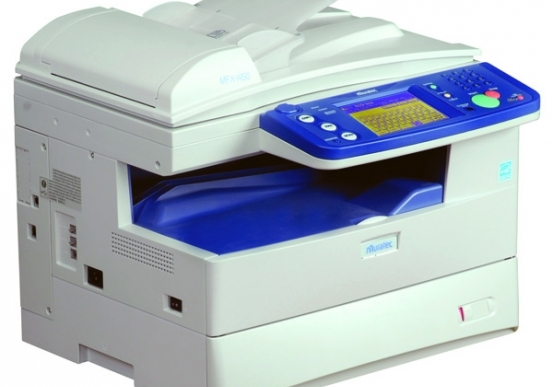 -MFX-2350D includes standard duplex printing. -Seamlessly capture document images and metadata (document indexing information) from the MFX-2355D touch screen and index them directly into document management software (ScanTag). Cassette Paper Weight 16 to 24 lb. Bypass Paper Weight 15 to 53 lb. Dimensions (H x W x D) 26.7" x 25.9" x 33.7"